On December 7, 2016, St. Louis Symphony musicians performed for about one hundred offenders at Missouri Eastern Correctional Center. 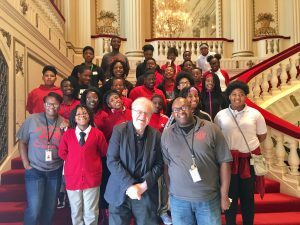 The concert was part of the St. Louis SymphonyCares program. STL Symphony violinist Ann Fink said the concert was about spreading hope. Fink teamed with Wendy Plank Rosen, Leonid Gotman, and Alvin McCall for a concert that included the music of Mozart, Gershwin, and Tchaikovsky. The STL Symphony musicians performed for more than an hour. The performance brought back memories for the concert’s special guest, Ron Boyer. He was serving time at MECC when STL Symphony musicians performed at the prison 15 years ago. Boyer was released from prison in 2004. “It was a little difficult coming back, but the music makes you feel so happy,” Boyer said. Boyer returned to the prison to introduce the musicians and share words of encouragement with the offenders. The concert also marked a return for Gotman. The veteran STL Symphony violist was part of the performance that Boyer saw at MECC 15 years ago. Over the past year, Boyer and Gotman have reconnected through concerts at Powell Hall. It is also proof that the gift of music can enrich people’s lives anywhere.